COLUMNS What is next in Syria after Afrin? The Foundation for Political, Economic and Social Research (SETA), one of the leading think tanks in Turkey, has been publishing its annual "European Islamophobia Report" (EIR) for the last three years. The third issue of EIR, "European Islamophobia Report 2017," edited by Enes Bayraklı and Farid Hafez, consists of an evaluation of Islamophobic developments and incidents in 33 European countries. Forty researchers living in different European countries contributed to these reports. The main purpose of the EIR is to analyze anti-Islam trends and developments and increase awareness about the anti-Muslim propaganda and hate crimes. The report provides valuable knowledge for policymakers, social activists and any other interested individuals who want to struggle against anti-Islam and anti-Muslim discourse. 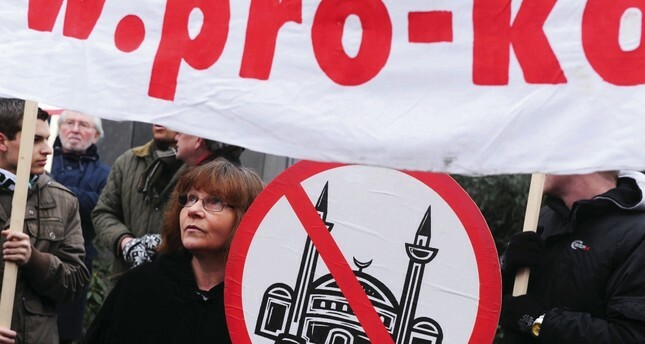 Although most European countries deny the existence of Islamophobia, anti-Islam and anti-Muslim sentiment, the report demonstrates that racism and hate crimes against Muslims became widespread and began to normalize throughout Europe. Sadly enough, just presenting some numbers and a few examples among many of them can easily show the dramatic increase of Islamophobia in Europe. In 2017, some 546 anti-Muslim attacks took place in Spain. Hate crimes against Muslims and attacks on mosques almost doubled in London. In Poland alone 664 hate crimes were committed from January to October 2017. Fourteen percent of all Muslims in Norway were subjected to verbal or physical attacks and 25 percent of all Muslims living in Malta were harassed. Just in Germany, the largest and most important European county, almost 1,000 attacks were committed against Muslims and there were more than 100 attacks on mosques. Sixty percent of Muslim teachers think that they are subjected to discrimination. Besides Muslims, refugees are also subjected to attacks and discrimination. On average, 5.2 attacks are committed daily against refugees. Far-rightist extremists even attack the officials who help refugees. Due to these developments, it is necessary for European countries to initiate an effort to counteract this normalized racism and hate. Every passing day, racist and xenophobic tendencies are further entrenched in European societies and institutions. Today, not only some extremist groups, but also European mainstream rightist and leftists political parties pursue racist political discourses on Islam and Muslims. The process came to such a point that victimized Muslims are even afraid of complaining about the attacks committed against them. According to a survey published by the EU Agency for Fundamental Rights (FRA), only 12 percent of Muslims report anti-Muslim discrimination cases to officials. That is, the available data and numbers are only the tip of the iceberg. European countries and EU institutions such as European Parliament need to recognize Islamophobia as a form of racism. European actors should fight against all kinds of discrimination, racism, hate crimes and human rights violations as they fight against anti-Semitism. The EU should initiate a de-radicalization program in order to re-establish multicultural Europe. Europe should not surrender to far-right or far-left terrorists, or else otherwise it will continue to lose its moral superiority. Moreover, unless Europeans take necessary measures against Islamophobia and other kinds of xenophobia, European states are destined to lose rationality in their policies. This wicked process is similar to a double-edged sword that cuts Muslims and non-Muslim Europeans, as well.